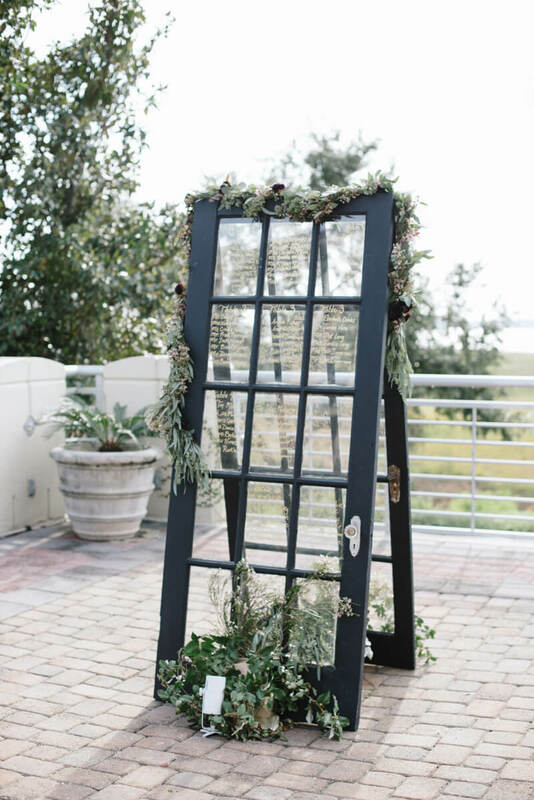 Micha and Joe planned an outdoor wedding at Harborside East in historic Charleston, S.C. They incorporated bold elements balanced with light accents and colors to create a dynamic and gorgeous event at Charleston’s premiere waterfront venue. Micha couldn’t stop smiling as she got ready for her big reveal. Paper Dolls provided hair and makeup services that made her feel as beautiful as ever. 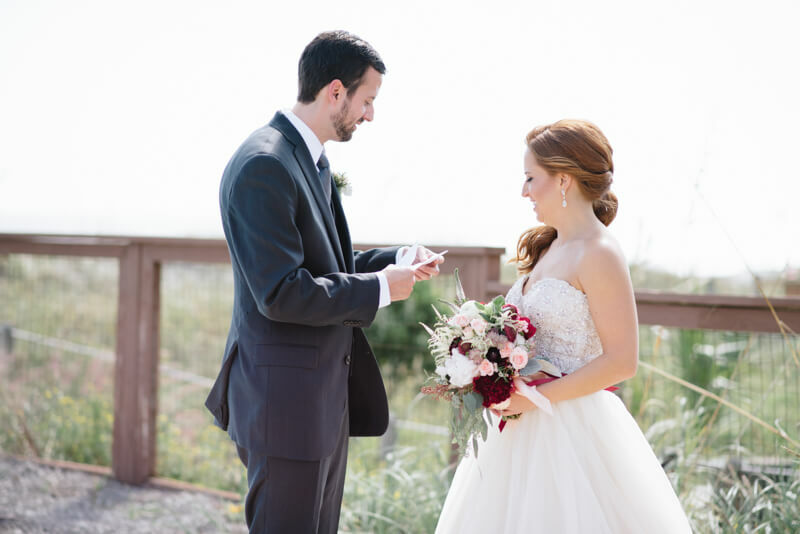 In her gorgeous ball gown, statement earrings and lilac-colored shoes, Micha embraced Joel during their first look moment. He looked especially handsome in a gray tuxedo with light gray tie and white pocket square. Britt Croft Photography took photos for Micha and Joel on this especially bright and perfect day in Charleston. The couple gathered with their bridal party for pre-ceremony photos. Micha’s bridesmaids looked stunning in their long lilac-colored gowns, alternating styles and necklines for a cohesive yet personalized approach. 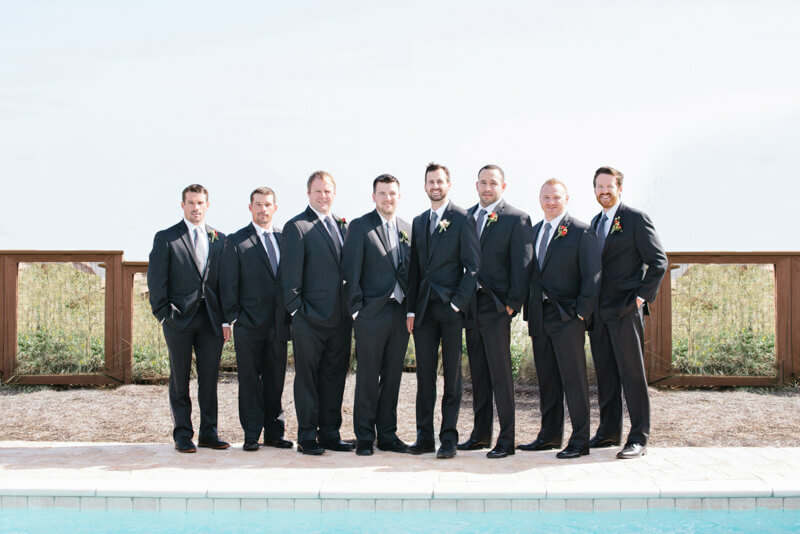 Joel and his groomsmen all matched in gray tuxedoes and collectively, the entire group evoked soft, colorful elegance before they took their respective spots for the ceremony. Intrigue Design and Events was on-hand to plan the entire day. Micha was escorted down the aisle, where trademark South Carolina palmetto trees lined the back of the terrace. In front of a loving group of family and friends, Micha and Joel said “I do” with plenty of smiles and laughter to go around. This venue boasts exquisite panoramic views of the Cooper River and Charleston’s famed Ravenel bridge. Micha and Joel took advantage of this unique feature of their venue and were provided with amazing backdrops in many of their photos. Guests found their seats thanks to a uniquely-positioned pair of glass doors, embellished with glass paint and floral accents. The dynamic bold floral arrangements, lighting and drapery for the reception were all exquisitely designed thanks to Loluma. Laser cut linens from Nuage Designs were draped atop dark purple linens to match the dark drinking glasses on the tables. 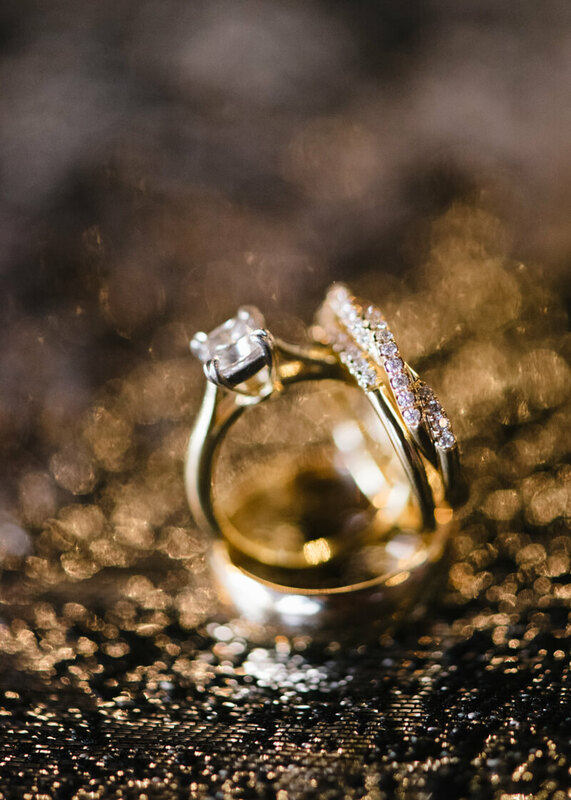 The contrast between light and dark, stylish and classic, was a feast for the eyes. Micha and Joel took in the scene from their reception in gorgeous lucite chairs thanks to Event Works, who also provided all of the rentals for the big day. 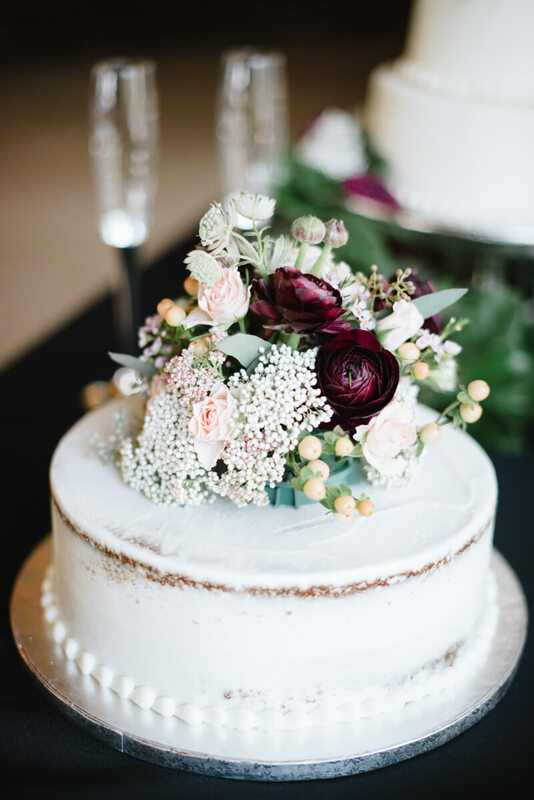 Their sweet but simple cake creation was created by Whole Foods. For such a bold affair, the traditional, yet colorful dessert was a charming addition. Guests enjoyed dinner underneath the string lights thanks to Cru Catering. And while enjoying their meal, Darby Entertainment provided the best music for guests to relax, enjoy and celebrate the new couple. Even though Micha and Joel aimed for the bold, they pulled off an equally elegant and stylish affair. While some trends come and go, it’s always important to incorporate designs that can stand the test of time. 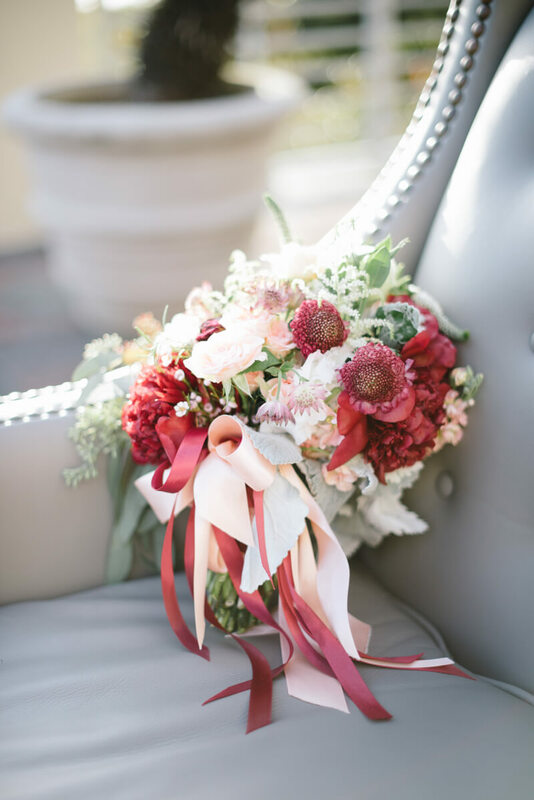 And their October wedding in Charleston certainly leaves a lasting impression.